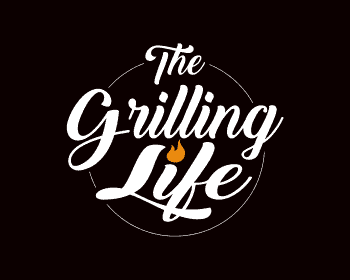 Proudly support your favorite sports teams and get your grill on at the same time! Need I say more? Well, probably not but I am going to anyways. 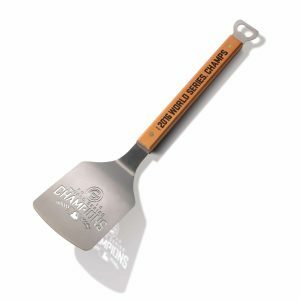 If you are a sports nut and a grill junkie like I am, then The Sportula products line is for you. One of the great things about the Sportula products is that almost every sports team are represented. From baseball to football, hockey, and basketball. They even have all the college team logos. I have even seen Military logos, hunting, fishing, firefighters, #1 and more. In this Sportula Products Review, I will discuss how well each product works, how durable they are, minor drawbacks if any, and where to get the best deal when you buy them online. By the time I am done, you should have a good idea as to whether the Sportula Products are right for you. These are made with Heavy-duty stainless steel and feature long handles to keep your hands away from the heat. The maple handle and stainless steel are very sturdy and well made. The bottle opener on the end is perfect for opening a beer while grilling. heat stamped hard maple handles. Each piece is very substantial and well balanced. These tools have a very nice feel to them. They are easy to use, and the long handles help keep your hands away from the fire. 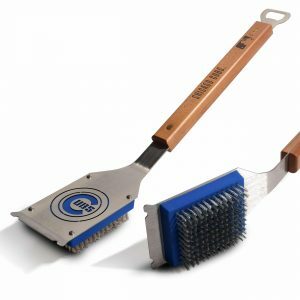 This grill brush is a heavy duty brush with a convenient bottle opener. It includes laser-cut logo and heat stamped hard maple handles. Another sturdy product that has a great look and feel to them. A neat feature is that they come with a colored background matching your sports team colors. The hard wire cleaning bristles are built to last. 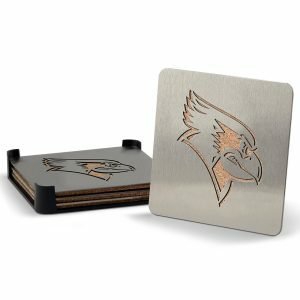 These coasters withstand hot or cold temperatures perfectly while protecting your tables. They are sturdy, and the strong cork backs help to keep your drink from moving or sliding. These things are great. Right away I noticed how solid, balanced and well made all the Sportula Products where. The laser cut logos looked sharp and did a great job of representing my favorite team. They have been able to handle even my toughest cooks and still look almost new. Even after nearly two years, I hardly see a scratch on the stainless steel. These are not just novelty products but tools that actually work as well as they look. I have brought my Sportula to numerous tailgating parties and always get great comments about them. I have even purchased some as gifts for friends. The Sportula Products currently have a 4.7 out of 5-star average rating on Amazon. Perfect for the Sports Fanatic! To be honest, the only complaints I have been able to find are a few that say the packages were damaged while shipping. That tells you something about this product. Not just novelty products but grilling tools that really work. They make great gifts for the sports fan that has everything. Should You Buy A Sportula Product? In my opinion, this is a solid buy. 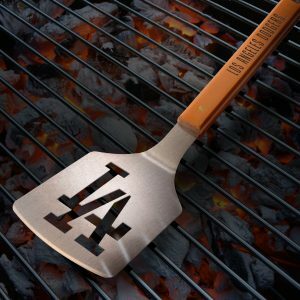 I highly recommend these products for every sports fan and even the casual griller. These products aren’t going to stop hunger or end world peace, but they are great additions to every sports fans collection. They make great grilling tools too. They also offer same day shipping if you want it right away. Amazon is also one of the most reliable companies when it comes to purchases. If you have any questions about any of the Sportula products or want to leave your own personal review, leave a comment below. I hoped you enjoyed this review and you are one step closer to joining me in “The Grilling Life”! Love that you can combine the love of sports with the love of grilling! It’s definitely grilling season here in Arizona so this post is just perfect to find the perfect gift for my hubby. 🙂 Thanks so much for your informative post! Hi Grace. I am glad you found this article helpful and I know your husband will love his gift. Don’t forget to check back in from time to time as I am always on the lookout for helpful tips or stories I can share. Happy Grilling! Wow, the sportula wants to make me start grilling. I love grilling myself and the sportula product looks like a thing that will come handy. There nothing like enjoying grilling even as you enjoy what comes off it, lol. Anyways, the samples you displayed right here are worth looking up. Thanks for looking out for those that grill man. It is my pleasure. Us grilling enthusiasts need to keep an eye out for each other :). I’m so glad you enjoyed this info and hope you stop by again. Happy Grilling my friend. As someone who uses the grill at least once a week, the Sportula collection will be something I need to look into. 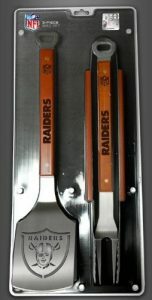 My brother is a big Raiders fan, he like to grill also, this would make a great Birthday or Christmas gift. Maybe I can leave a hint around the house and someone will get me one for the holidays. We think alike John. I have already started leaving my hints around the house. :). I already own a set but I have many more teams to support. Thanks for stopping by and don’t forget to check back in from time to time as I am always on the lookout for helpful tips or stories I can share. Happy Grilling! GREAT Christmas gift idea for the Sports fan who has everything! Where I’m from, the big (HUGE) sport is hockey… but grilling in the Canadian winter isn’t so fabulous. If the Blue Jays do well again next Summer though, this will be something I’ll need to look at for my brothers. Genius idea, combining food and sport in a creative way. Hi Marlaine and thank you for stopping by. Did you know that you can find all your favorite Hockey teams represented by the Sportula products? They cover almost every sport. I understand what you mean about winter grilling but check out my article http://thegrillinglife.com/how-to-grill-in-winter and you may change your mind. I tried so hard to come up with any cons for this product and that was about the only negative in the reviews I could find. Kind of silly, I know. Don’t forget to check back in from time to time as I am always on the lookout for helpful tips or stories I can share. Happy Grilling! What a perfect present for the manly man! 🙂 Christmas is coming up and I’m sure that this is going to be a wonderful gift idea for hubbies, brothers, sons, grandfathers, uncles or friends. Thanks so much for all the details!! Hi Andrea and my thoughts exactly. I know I have already started dropping hints at my house. 🙂 Thanks for stopping by and I am so glad you enjoyed my article. Don’t forget to check back in from time to time as I am always on the lookout for helpful tips or stories I can share. Happy Grilling! in australia where i live we call them barbeques(bbq’s) but the same result occurs.mouth watering food done to your recipe. every person has their own ‘cooking time’.well done, medium rare, or rare. (depending on the foods being cooked. )these utensils look the part, having team logos/colours is a great idea.sounds like a great present, and they will last.great review,i can almost smell that steak on the ‘barby’. You’re right Greg. No matter what it is called, it is delicious! 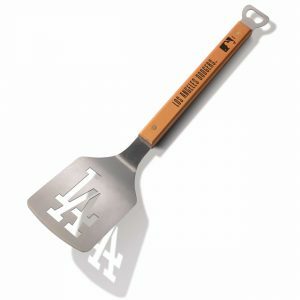 I received a Sportula of my favorite sports team last Christmas and loved it. I still am using it to this day. Thanks again for stopping by. I hope on day I make it to Australia to taste authentic Australian barbecue! Cheers!